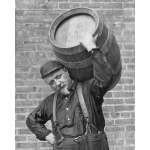 For centuries, it was customary for brewers -- particularly those in Europe and, later, in America -- to brand or paint a six-point star on the ends of their beer kegs. And, indeed, many brewers of the 19th and early 20th centuries actually fashioned their logos to incorporate the six-point star -- known as the "brewer's star." So, what exactly does the star have to do with beer or brewing? Of course, there has been much speculation that the brewer's emblem was somehow descended from the Star of David -- a curious match to the brewer's star. It has even been suggested that King David himself was a brewer. But others assert that the emblem's use by beer-makers originated indpendently of the Jewish Star, and has no historical connection thereto. The latter have some historical facts on their side. This geometric figure, which is technically called a hexagram, has existed throughout the world for several millennia, usually as a talisman. This includes the Middle East, Africa, and the Far East. The earliest appearance in a Jewish context is in the 13-16 centuries BCE, but long after that it continued in widespread use in other circumstances not associated with the Jewish faith. The first use of the term "Shield of David" was about 1300 CE when a Spanish practitioner of Jewish mysticism wrote a commentary on the central book of that mysticism, the Zohar. The first actual linkage of the hexagram to a Jewish community appears in the early 1300s on the flag of the Jewish community of Prague, which was designed with permission of Charles IV when he became king of Bohemia. It is known that the star was the official insignia of the Brewer's Guild as early as the 1500s, and that its association with beer and brewing can be traced as far back as the late 1300s. Whatever the case, it is clear that the brewer's star was intended to symbolize purity; that is, a brewer who affixed the insignia to his product was thereby declaring his brew be completely pure of additives, adjuncts, etc. In fact, folklore has it that the six points of the star represented the six aspects of brewing most critical to purity: the water, the hops, the grain, the malt, the yeast, and the brewer.